THE ALLURE of fly-fishing takes many forms. It’s said anglers go through an arc of reasons why they fish — beginners enjoy simply being on the water. Intermediate anglers start counting numbers of fish in a day. Advanced intermediates count fish but also start “headhunting” — looking for that large trophy fish that will make his Instagram shot the talk of the day. Advanced anglers travel, looking for exotic species they’ve only seen in images of movies. And then the lifetime anglers — the ones who will never give it up — those diehard souls come full circle and just fish for the sheer joy of being on the water. 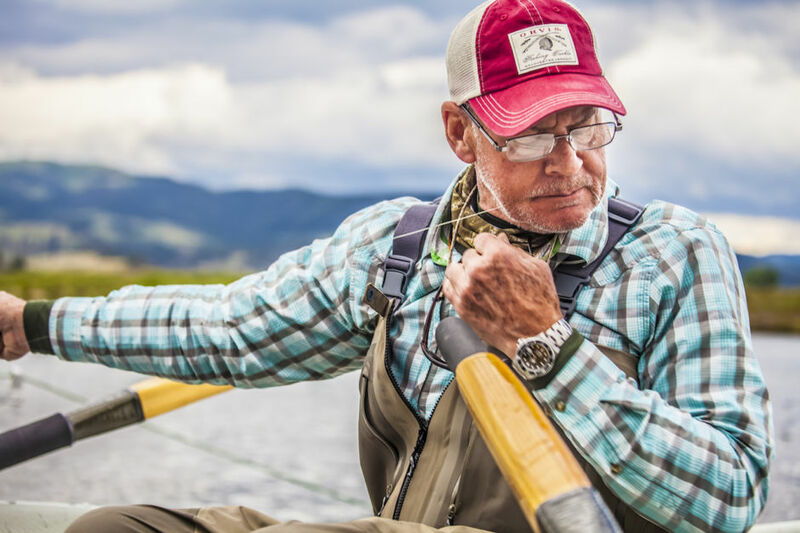 Personally, fly-fishing has been a vehicle to see the world. I’ve worked in many aspects of the industry, and now find a home in photographing adventure travel and fly-fishing around the world. Fishing is an excuse to travel; a reason to meet people I otherwise would never have chanced upon, to see waters and villages I’d never otherwise have a reason to travel towards, to experience the world in an entirely new way. And sure, somehow I always manage to pick up a rod when on location. But it’s rarely the “fishy” memories that resurface… it’s the random airport meetings in small-town Belize, the laughter in remote Russian tundra camps, and the giddiness that comes from chasing a storm on a flats skiff and, thoroughly drenched, wondering what the world is going to throw at me next. Sometimes, simplicity trumps all. 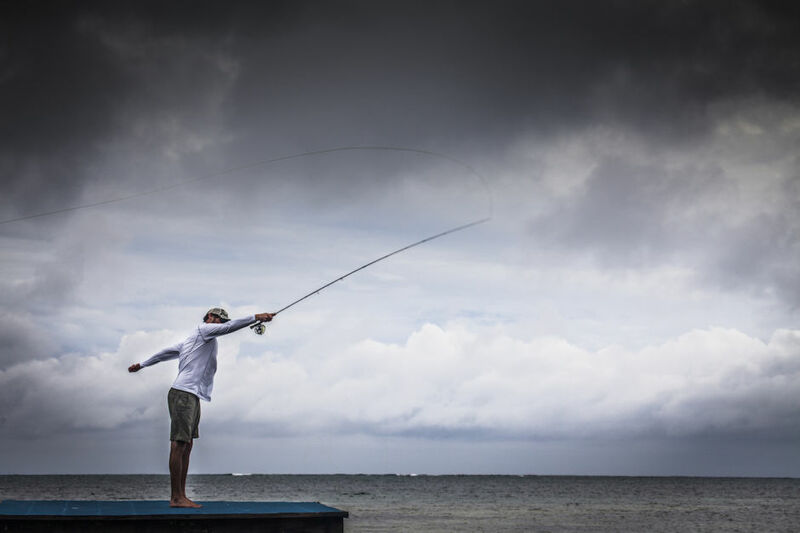 While on a photo shoot on Ambergris Caye, an island in northern Belize, angler Joseph Pinkard took the time to grab a rod and log a few casts off the dock of El Pescador Lodge. It was a stormy week; the water turbid and the clouds heavy, but for one brief moment we caught a hint of blue sky peeking through. It just goes to show, regardless of what the weather brings, Belize is always in it for the win. This has to be one of my favorite “river portraits” of all time. Duck, a seasoned angler and true Southern gentleman, was enjoying a quality spring day on the Missouri River in central Montana. The Missouri, a tailwater storied in fly-fishing circles, is known for its high numbers of brown and rainbow trouts and the unique, intense fly-fishing culture in the little towns that dot this stretch of the river. Here, Duck was changing out his flies and adding a bit more tippet, making for a perfect “working man’s” portrait. I will forever be enamored with what many would consider bad weather. 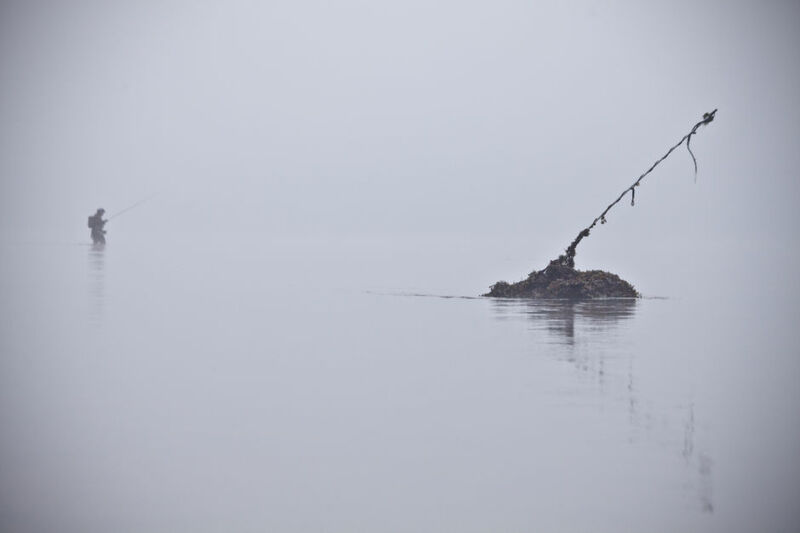 While fishing for sea-run cutthroat trout in the Puget Sound outside of Seattle, we experienced some of the thickest, soupiest fog I’ve seen to date. Somewhere out in the grayness, we’d hear ships passing and seals frolicking, but our focus was on the task at hand: Fishing. The world becomes something special when you can’t separate the water line from the horizon, and everything slows down. The waters surrounding the small South Pacific atoll of Anaa are so clear sometimes they seem to lack color. It’s only when the water edges past the white sand flats and gains some depth that the turquoise tones appear. The reflection of the water makes the bottoms of clouds crossing above turn green, and legend has it that the phenomenon functioned as a navigational aid for sailors in these seas. 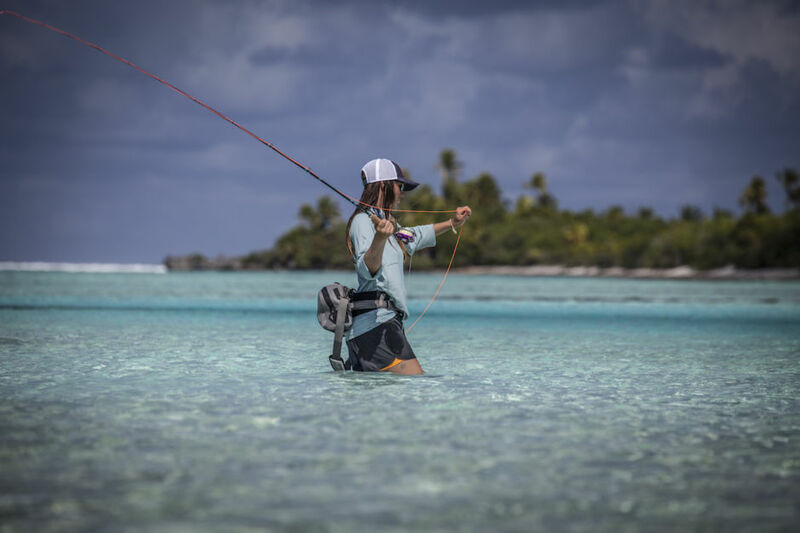 For angler Maddie Brenneman, Anaa marked her first saltwater fishing trip, and she made the most of it, chasing bluefin trevally and bonefish in the shallow waters of the lagoon. Working a long season in a fly shop on Montana’s Missouri River, eventually, one gets bored of trout and seeks out different prey. Hot July days found shop rat and savvy angler Jake Gates dragging a stand-up paddle board / kayak hybrid up a steep hill and onto the waters of Holter Lake. 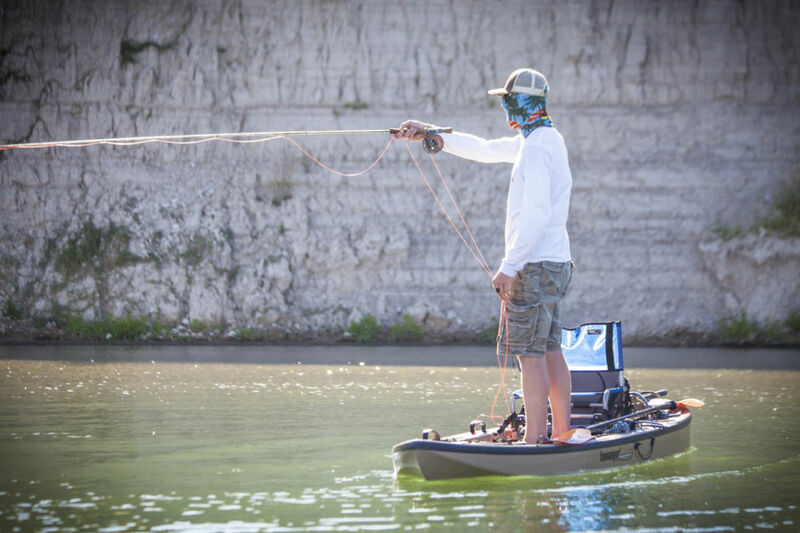 He’d discovered carp lived in the shallow, muddy waters along one side of the lake, and the SUP hybrids were the perfect vehicle to chase the wary species. It’s as close to saltwater fishing as one can get in the Big Sky State. 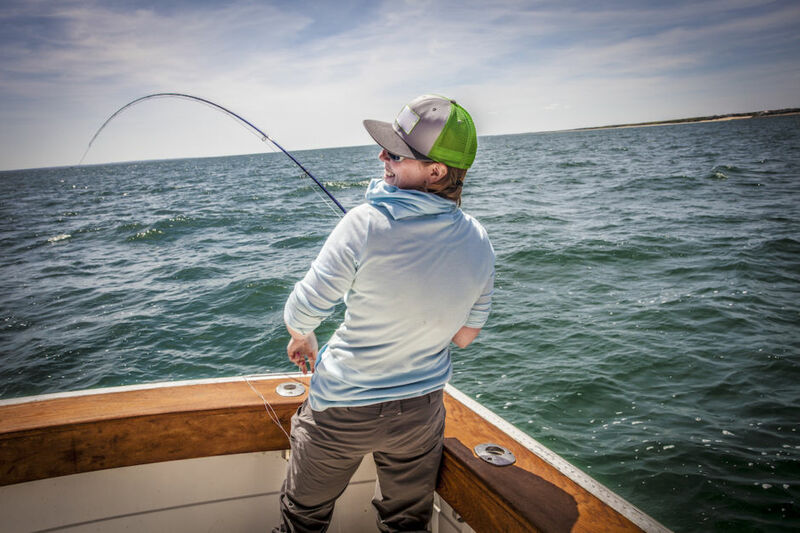 After spending the entire night prior chasing striped bass with her fly rod, Jackie Jordan showed no signs of slowing down while fishing the waters off Martha’s Vineyard for bluefish. She’d spent several days exploring the island, wading beaches and bays chasing “stripers,” and without pausing for a break, the fly girl wasted no time hooking into a bluefish, laughing all the way. In Montana, the trout grow big and healthy. It’s one reason why anglers from around the world perpetually have “the Big Sky Sate” on their destination bucket list. The Missouri River is famed for growing large, healthy fish — and plenty of them. 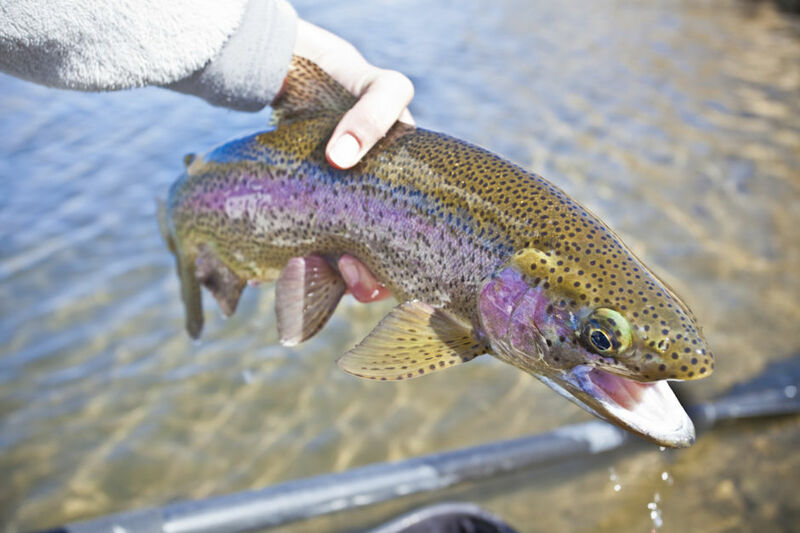 This healthy rainbow fell prey to a Czech nymph on a bright spring day and posed for a picture before swimming back to his cold water home. Russia's Ponoi River, located above the Arctic Circle in Murmansk Oblast, is one of the world’s most famous Atlantic salmon fisheries. 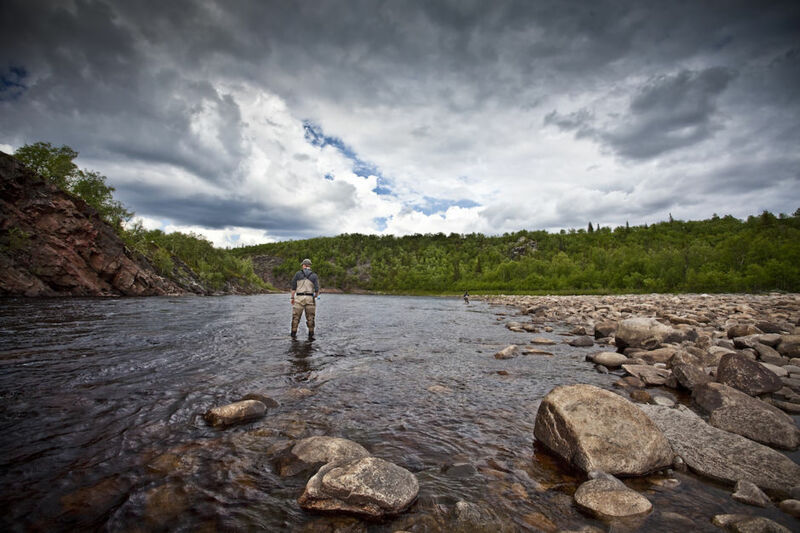 The river is fished from remote camps dotted along the tundra and staffed with an international cast of guides with bold fishing and survival skills. It’s rare the guides get a day off during the 7-month season, but when they have a few hours for themselves, they take to the water. Guides Rory Patterson and Angus Walton explored a tributary to the Ponoi, the Purnache; taking a jet boat upriver and then hiking inland along the tundra. 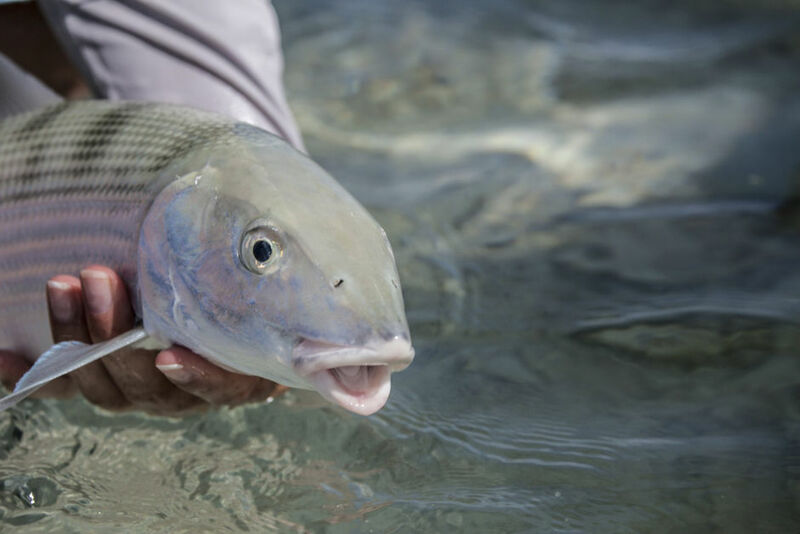 Bonefish are one of the more sought-after saltwater gamefish in the world. Always light-colored, their tones flux in response to their natural environment. In Belize, they can take on more of a cloudy tan tone, in other parts of the world they go almost chrome. The bonefish we encountered while exploring Anaa Atoll in French Polynesia were large, healthy, and a stunning silvery color. Cast a crab pattern in their feeding path, give it a few twitches, strip the fly in… and then it’s game on. We go everywhere! Exploring new locations that have not been fly-fished much is, hands-down, my favorite part of the job. 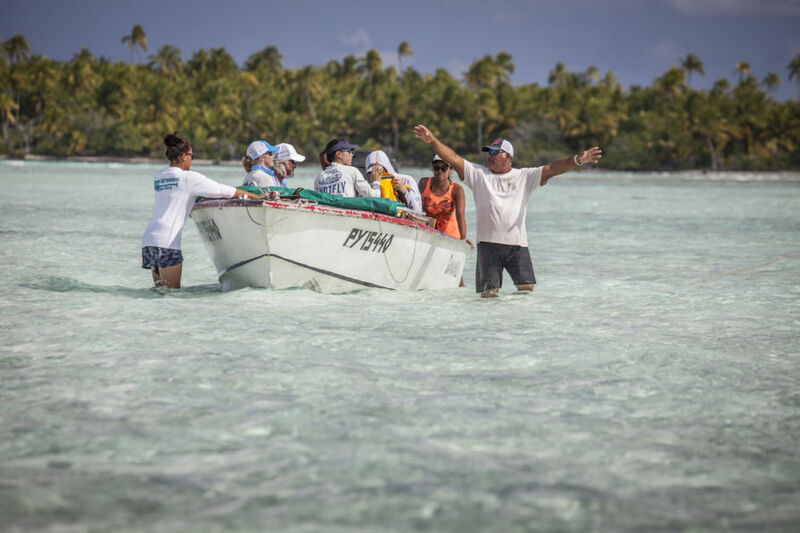 Working with locals, like Raphael on Anaa Atoll, makes the whole experience rather eye-opening. These men and women know their waters far better than any foreigner could hope to and, while we might not speak the same language, we manage to get by.